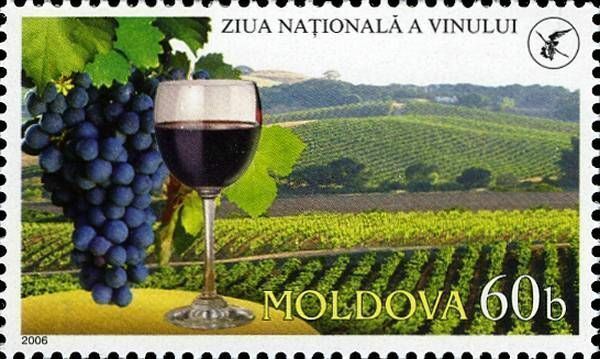 On 7 October 2006, the Post Office of Moldova (Poșta Moldovei) issued a postage stamp with the title National Wine Day. The issue comprises one stamp, with an associated cancellation (postmark) and first day cover (FDC). The designer was Vitalie Roşca. The printing was performed by Tipografia Centrală, Chişinău. With a production of 124,200 tons of wine (as of 2009), Moldova has a well-established wine industry. It has a vineyard area of 148,500 hectares (367,000 acres) of which 107,800 hectares (266,000 acres) are used for commercial production. The remaining 40,700 hectares (101,000 acres) are vineyards planted in villages around the houses used to make home-made wine, or 'vin de casa'. Many families have their own recipes and strands of grapes that have been passed down through the generations. In 2009, Moldova was the twenty-second largest wine producing country in the world. Most of the country's commercial wine production is for export. Read more.. This article uses material from the Wikipedia article 'Moldovan_wine', which is released under the Creative Commons Attribution-Share-Alike License 3.0.